Minnesota’s Darcy Kuemper established a new franchise record for longest individual shutout streak and three veteran goaltenders – Vancouver’s Ryan Miller, Florida’s Roberto Luongo and Nashville’s Pekka Rinne– posted shutouts on a night highlighted by goaltending performances. * After not surrendering a goal through Minnesota’s first two games, Kuemper had his season-long shutout streak snapped at 4:02 of the third period versus Anaheim. His stretch of 163:46 is the longest individual single-season shutout streak in Wild history (he was off the ice for 0:16 in MIN's opening two games). The team shutout streak of 164:02 fell short of the franchise record (169:20) by just 5:18. * Kuemper stopped the first 66 shots he faced this season and 70 of 72 overall for a 0.67 goals-against average and .972 save percentage. At age 24, he became the youngest goaltender in NHL history to post shutouts in each of his team’s first two games of a season. * Miller stopped all 27 shots he faced for his first shutout in a Canucks uniform and the 30th of his career, tying Islanders’ Jaroslav Halak for sixth among active netminders. It was just his second shutout since March 21, 2012, a span of 109 games played. * Luongo stopped all 26 shots he faced, including 14 in the third period, to record his second shutout since rejoining the Panthers at the Trade Deadline last year – his other shutout also came against Buffalo in the first game of his second stint with Florida on March 7 (2-0 win). Luongo’s 67 career shutouts lead all active goaltenders and catapult him past Patrick Roy into a tie with Roy Worters for 13th on the all-time list. * Rinne stopped all 31 shots he faced for his 33rd career shutout and improved to 5-0-0 with a 2.33 goals-against average and .918 save percentage in six career games versus the Jets. The line of Radim Vrbata (1-1—2), Daniel Sedin (1-1—2) and Henrik Sedin (0-2—2) combined for six points as the Canucks improved to 3-0-0 with a 2-0 win over the Oilers. * Vancouver last started a season with a 3-0-0 record 15 years ago when they began the 1999-2000 campaign 3-0-1 (tie). * Vrbata and the Sedins have combined for 17 points (6-11—17) in Vancouver’s first three games, scoring six of the team's 10 goals. All three players have points in each of the team’s first three games: Vrbata (3-2—5), D. Sedin (1-5—6) and H. Sedin (2-4—6). * Miller improved to 9-0-0 in his career versus Edmonton, including a 5-4 shootout win in Vancouver’s last game. He is also undefeated against the Coyotes (7-0-0). Andrew Cogliano ended Minnesota’s season-long shutout streak at 164:02 with his game-tying goal in the third period and Corey Perry netted the game winner with 8:25 left in regulation as the Ducks overcame a 1-0 third period deficit to win 2-1. Anaheim has won four straight games since dropping their season opener in Pittsburgh. * Perry has a point in each of Anaheim’s five games (5-2—7), marking his best start to a season through five team games. He has 17-15—32 in 33 career games versus the Wild. * Perry’s winning tally was his first of the season and 51st of his career (19th among active players). He led the Ducks and tied for third in the League last year with nine deciding goals. Offseason acquisitions Mike Ribeiro and James Neal each scored as the Predators spoiled Winnipeg’s home opener with a 2-0 win. * Nashville improved to 3-0-1, their best start since beginning the 2005-06 season with eight straight victories. The Predators are now 10-3-2 against the Winnipeg/Atlanta franchise since the start of that season. * Ribeiro has goals in consecutive games for the first time since scoring on Oct. 19 and 22 last year versus Detroit (2 goals) and Calgary (2) while with the Coyotes. * Neal’s goal was his first in a Predators uniform and brings his career total versus the Jets to 11-5—16 in 13 games. * Rookie Filip Forsberg recorded the primary assist on Neal’s goal to extend his career-best point streak to four games (1-4—5). Henrik Zetterberg assisted on all four Red Wings goals and Johan Franzen's second of two goals stood as the game-winner as Detroit won 4-1 at Toronto in the first half of a back-to-back, home-and-home set. * Zetterberg’s four assists equal his career high accomplished three previous times: March 20, 2009 vs ATL, Dec. 15, 2010 vs. STL and March 26, 2012 vs. CBJ. It was his highest single-game point total since Feb. 1, 2013 when he matched a career-high with five points (3-2—5) in a 5-3 win vs. STL. * According to the Elias Sports Bureau, Zetterberg is the first Detroit player with at least four points versus Toronto since Nov. 27, 1996 when current Maple Leafs President Brendan Shanahan tallied 3-1—4 in the Red Wings’ 5-2 win. He now has 6-8—14 in 10 career games against Toronto. * Franzen netted his first two goals of the season for his first multigoal game since Mar. 7 (2-2—4 vs. NJ). His first winning tally of 2014-15 was the 42nd of his career, which ranks sixth on the franchise’s all-time list, three behind Pavel Datsyuk for fifth (45). * Gustav Nyquist (1-1—2) scored in his fourth straight game and now has 27 goals in his last 38 regular-season games. Elias says Tomas Holmstrom (4-0—4, 2007-08) was the last Red Wings player with at least one goal in each of the team’s first four games to start a season. Nyquist now has five points overall this season (4-1—5) and 4-2—6 in five career games versus Toronto. * Justin Abdelkader (1-1—2) also had a multipoint game for the Red Wings. * Toronto and Detroit will contest head-to-head games on consecutive nights for the first time since the teams split road wins on Oct. 14 and 15, 1997 (3-2 DET, 4-3 TOR). Sergei Bobrovsky stopped 29 of the 31 shots he faced and Ryan Johansen’s third goal of the season was the game-winner as the Blue Jackets overcame a late Flames rally to win 3-2. Columbus is now 7-1-2 in its last 10 games versus Calgary. * Johansen extended his season-long point streak to four games (3-3—6). Last year he set a career-high and became the third player in franchise history to score at least 30 goals in a season (33). * Matt Calvert (1-1—2) and Mark Letestu (0-2—2) had multi-point games for the Blue Jackets. Letestu now has 2-6—8 in 12 games vs. CGY, matching his highest total against any team (3-5—8 in 10 GP vs. NYI). * Nick Foligno (1-4—5) and Cam Atkinson (3-2—5) each recorded an assist to extend their season-long point streaks to four games. The NHL announced the selection of the Nashville Predators, the city of Nashville and Bridgestone Arena as hosts of the 2016 NHL All-Star celebration. The League’s mid-season showcase will take place Saturday, Jan. 30 and Sunday, Jan. 31 and will include the Honda NHL All-Star Skills Competition and the NHL All-Star Game. 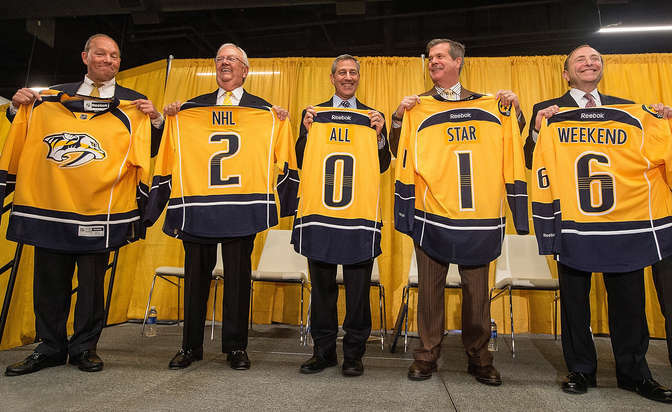 The 2016 NHL All-Star Game will mark the first time the NHL All-Star activities will take place in Nashville. The Predators and Nashville previously hosted an NHL signature event, successfully welcoming thousands of NHL fans, executives and personalities to the city for the 2003 NHL Draft. Sabres goaltender Jhonas Enroth has stopped 112 of 115 shots he has faced in his past three games against Florida (1-1-1, 0.97 goals-against average and .974 save percentage) . . . Mike Santorelli scored his first goal with the Maple Leafs . . . Calgary’s TJ Brodie extended his point streak to five games (2-4—6) . . . Josh Jooris, an undrafted free-agent signing by the Flames in 2013, scored in his NHL debut . . . Sean Bergenheim scored the lone goal as the Panthers earned their first win of the season and first under coach Gerard Gallant. Florida won its fourth straight game in Buffalo and improved to 4-0-0 in its last four head-to-head matchups overall . . . The two top picks from the 2014 NHL Draft – Florida’s Aaron Ekblad (No. 1) and Buffalo’s Sam Reinhart (No. 2) – met for the first time when the Panthers visited the Sabres . . . Florida’s Dmitry Kulikov recorded an assist for his first point of the season and the 100th of his NHL career (24-76—100) . . . Bruins forward Milan Lucic has been fined $5,000 for an obscene gesture made during the game Thursday against Montreal, the National Hockey League’s Hockey Operations Department announced Saturday. The fine money goes to the Players’ Emergency Assistance Fund.